- Is the MSM Deliberately Trying to Cover Up A Murder? While Wikileaks doesn't openly reveal sources, Assange and Wikileaks are doing everything but drawing a map with huge arrow going from Wikileaks to Seth Rich. Present Day - A Third party, dissatisfied with the "official" explanation that Rich was the victim of a random "robbery" attempt, especially since nothing was taken from him after being murdered, hired a private investigator, Rod Wheeler, who just happened to be a former DC police homicide detective, has uncovered "tangible evidence on Rich's laptop that confirms he was communicating with WikiLeaks prior to his death," as reported by Fox5 News. Wheeler also told us, "I have a source inside the police department that has looked at me straight in the eye and said, ‘Rod, we were told to stand down on this case and I can’t share any information with you.’ Now, that is highly unusual for a murder investigation, especially from a police department. Again, I don’t think it comes from the chief’s office, but I do believe there is a correlation between the mayor's office and the DNC and that is the information that will come out [Tuesday]. Below is the Fox News report on this "breathtaking breaking development" as it is described at the beginning of the segment. It is noteworthy that the only high profile reports on this bombshell revelation coming out of the MSM, is the Fox News report above. Searching for this, we find a number of Independent Media sites discussing this breaking and developing news, which seemingly confirms the "conspiracy theories" that have run rampant since Rich's murder and the Wikileaks reward offer and Assange's interview, but no other MSM outlet is reporting on this. Is it a coincidence that just as the Seth Rich story was getting ready to break, the Washington Post once again publishes a story dealing with Trump and Russia, that has all the other MSM jumping on it, with claims from "unnamed" sources saying President Trump revealed "highly classified" information to the Russians during his White House meeting with Russian Foreign Minister Sergey Lavrov, about terrorism threats? We'll discuss the "coincidental" timing a little further below, but first lets take a look at the non-story that the MSM is dedicating a stupid amount of ink on. 1st: The only named source the Wapo tale uses, is President Trump's National security adviser H.R. McMaster, who was present in the meeting between President Trump and Lavrov, and calls the story "false." I have a brief statement for the record. There is nothing that the president takes more seriously than the security of the American people. The story that came out tonight as reported is false. The president and the foreign minister reviewed a range of common threats to our two countries, including threats to civil aviation. At no time, at no time, where intelligent sources or methods discussed. And the president did not disclose any military operations that were not already publicly known. Two other senior officials who were present, including the Secretary of the State, remember the meeting the same way and have said so. Their on the record accounts should outweigh anonymous sources. I was in the room. It didn't happen. 2nd: Even if elements of the story were true, the President of the United States has the constitutional authority to declassify information at will, as even Trump critics acknowledge. Given both those points, where exactly is the "bombshell" in the Washington Post report, other than the Post admitting that anonymous Deep State sources, who do not have the authority to declassify information, revealed classified information to the Post? Perhaps the bigger questions are 1) Is any of the Washington Post story true, given their recent history of "fake news" stories, corrections and denials; 2) What about this non-story justifies the Post and other MSM news outlets to completely ignore the murder of a DNC staffer with a connection to Wikileaks, at a time when massive DNC and Clinton campaign emails were leaked to Wikileaks? 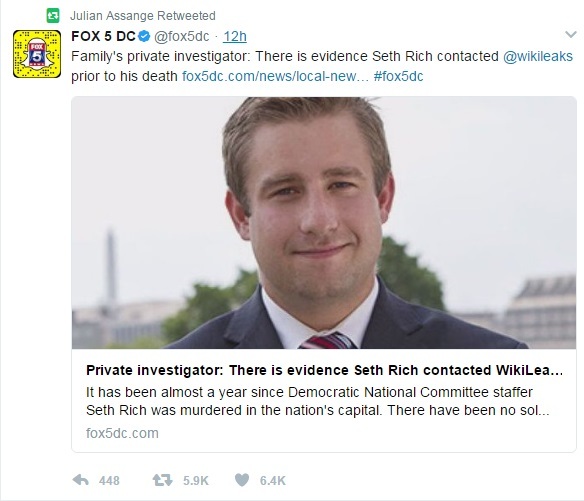 ; 3) Did the Washington Post and other MSM outlets deliberately time this story to bury the Seth Rich revelation? We will address all three of those questions below. 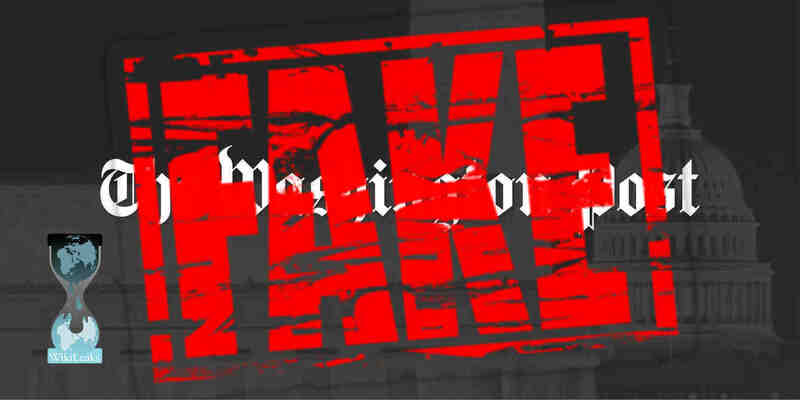 The Washington Post has been busted creating "fake news" stories that have gone viral, just to be forced to add corrections, change their articles, add editors note correcting their previous false assertions. For example, they used a dubious source in claiming that anti-Clinton websites were pushing "Russian propaganda" calling the source an "expert," just to later offer an editor notes saying they could not "vouch" for the shadowy organization they originally called an "expert." Second example, Wapo published a fake news story claiming "the U.S. electrical grid has been penetrated by Russian hackers," then after being forced to amend the piece, ended up writing a totally separate story completely negating their first viral story, saying the Russians weren't behind it. See a few more examples of Washington Post's "fake news" problem at "LIST: Washington Post's Josh Rogin Has a BIG Fake News Problem." At the rate Wapo is going, they have become nothing more than The National Enquirer on steroids, which is why many are saying to "consider the source" in relation to this latest non-story about Russia and Trump. It is also noteworthy to remind readers that the owner of the Washington Post, Jeff Bezos from Amazon, has ties to the CIA, with a rich history of manipulating news and spreading propaganda (Operation Mockingbird)), via a $600 million dollar contract. Now we have to ask what about the Wapo story, even if any of it is true, given that members of the cabinet that were present are calling it false, and the President has the constitutional authority to declassify information, was it such a bombshell that is justifies completely ignoring that a DNC staffer, one who had access to data that ended up in Wikileaks virtual hands, and who was murdered as the information was being released, to which the police were told to "stand down" on investigating said murder? The MSM, who all jumped on the "Russia" story, didn't just bury the Seth Rich bombshell which would mean burying it deep within their papers or news segments, but in the majority of cases, they never even reported on it. Nothing, zip, zilch....nada. Note - Searches at CBS News, ABC News and NBC News provide the same results, nothing on seth Rich and the Wikileaks connection. 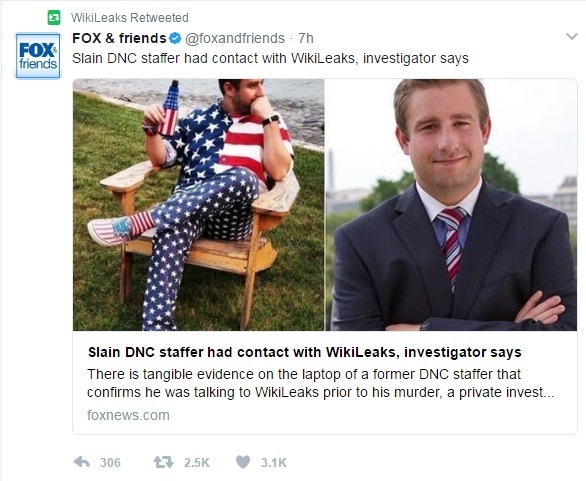 So, confirmation that Rich was in contact with Wikileaks, from a former DC homicide detective, and law enforcement was ordered to stand down, indicating a massive cover-up, and not one MSM outlet other than Fox News even bothers to report it, but instead they collude to turn a non-story into something viral? Anyone else think their is something wrong with this picture? 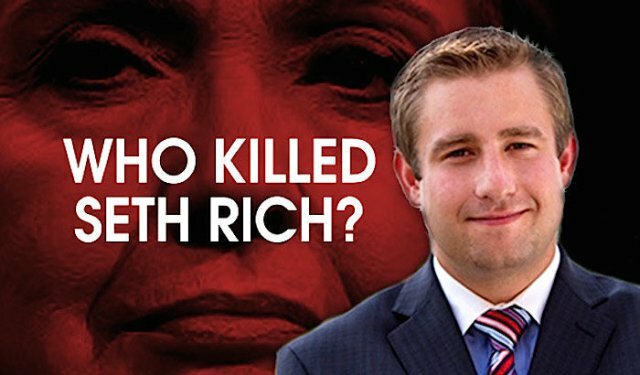 MSM COVERING UP THE QUESTION OF WHO HAD MOTIVE TO KILL SETH RICH? This one, in my opinion, is a far bigger question than any of the others, because recently it was revealed that the MSM had been "sitting on" a story of extreme importance, and only reported on it after a member of the independent Media blew it wide open. The story was of Obama's National Security Advisor, Susuan Rice being the name behind the "unmasking" of U.S. citizens, specifically members of the Trump campaign, but the bigger bombshell wasn't her name being revealed, it was that major news outlets had the story, refused to report on it, which was revealed at the same time by Mike Cernovich, where he tweeted the night before his news broke, that Bloomberg and the New York Times had the information and didn't report it. His assertion was proven true approximately 14 hours after he made his claim, when Bloomberg followed up with their own story on Susan Rice. Cernovich revealed at the time, that he has sources within the MSM news departments that had contacted him to let him know they were hiding the story, to cover-up for the Obama administration. While everyone jumped on the Susan Rice revelation, the more important aspect of that whole story was that the MSM was willing to sit on a story, hide the real news from their audience, in order to protect the Democrats. This begs the question of how far they would go to protect the DNC and Democrats? Would they also "sit on" a story that could implicate members of the Democratic party in a murder, or at the very least bring up questions as to the timing of Rich's murder just as information he had access to was being published by Wikileaks, and harming the DNC and the clinton campaign? Confirmation that Rich was in contact with Wikileaks and the police were told to stand down on the investigation, is a matter of corruption, cover-up of a murder, and should be on every front page.... but coincidentally, Washington Post rushes to publish a non-story, where President Trump supposedly did something that was not illegal, with every other news outlet blaring the same headlines, all the while ignoring the biggest story of the year. What is the first thing homicide detectives try to establish when solving a crime? Who had motive? Did the Washington Post publish the Russia story, and did the other MSM outlets rush to "report" on it, knowing the Rich story was going to break, and doing it just to avoid that very question? The establishment media has already made it very clear they have set themselves up as the "opposition party" to the Trump administration, that is no surprise after they failed to influence the election and get their chosen candidate elected, but if they have now become complicit in actively attempting to cover up a murder, or in trying to help stifle a legitimate investigation into a murder and the motive of said murder, then the rot goes deeper than any of us previously realized. Correction made to this article. RE: A third party hired Wheeler, not the family.